The day our innocence was lost. A rather significant date in recent history. What makes it even more significant is that it is 10 years since the attacks on the World Trade Centre, which ended in their collapse and the killing of thousands of people. That day our world changed. I changed. I remember how I found out. I was asleep, it was just another school morning, my alarm hadn’t even gone off. Dad came into my room without knocking. Not often has this happened, in fact only ever three times, but I’ll get to that shortly. 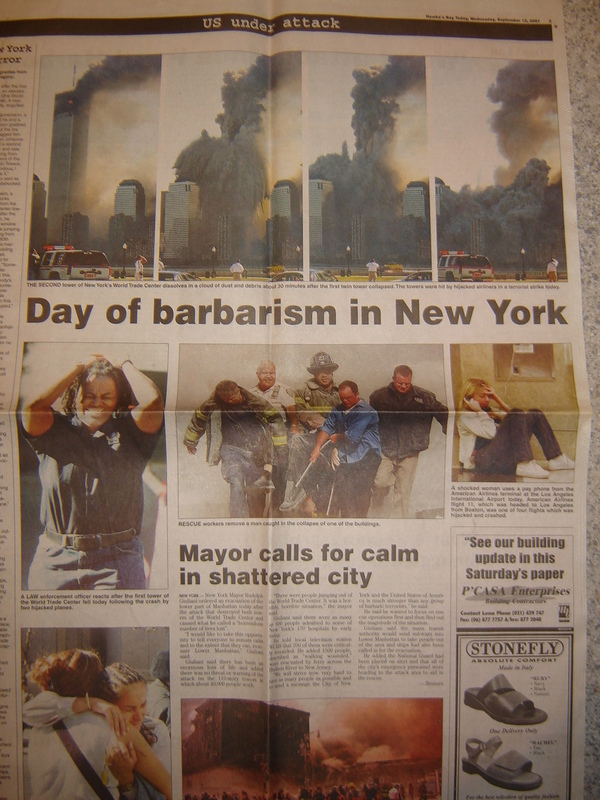 He kept it short and sharp and said, “The Twin Towers have collapsed.” For some reason I remember those exact words. It’s funny how these things stick. 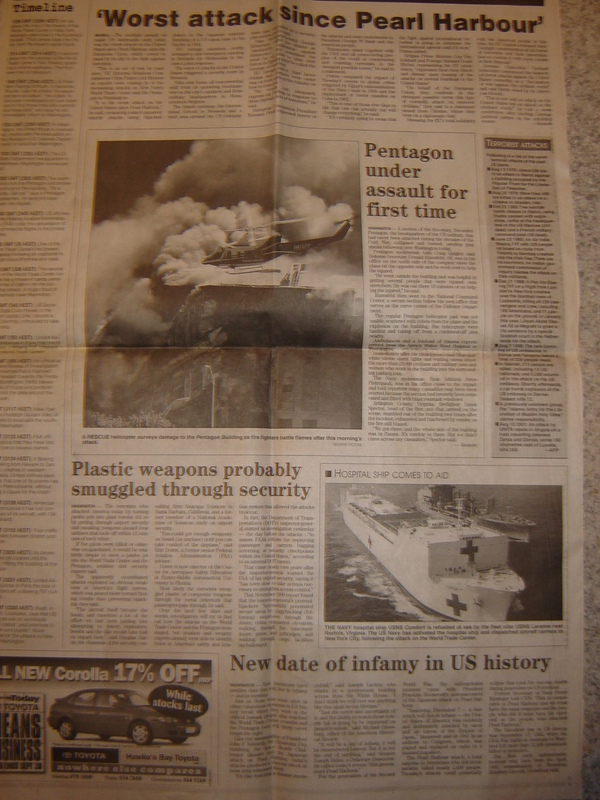 The only thing I remember doing that morning was sitting on my parents bed watching the news broadcast. Seeing the towers collapse, people running. It made the world shrink. I don’t remember getting dressed, having breakfast, all the usual things and somehow I ended up at school. It was the only topic of conversation in all my classes of the day. The one that stuck in my mind most was Social Studies. Our teacher, Mr Kane – who was one of the best teachers I have ever had to this day – explained it all. Even the bits we hadn’t seen on the news yet – who they thought did it etc. It was just so surreal, even on the other side of the world. There is no way you can even imagine what the people of New York and the US were even going through. 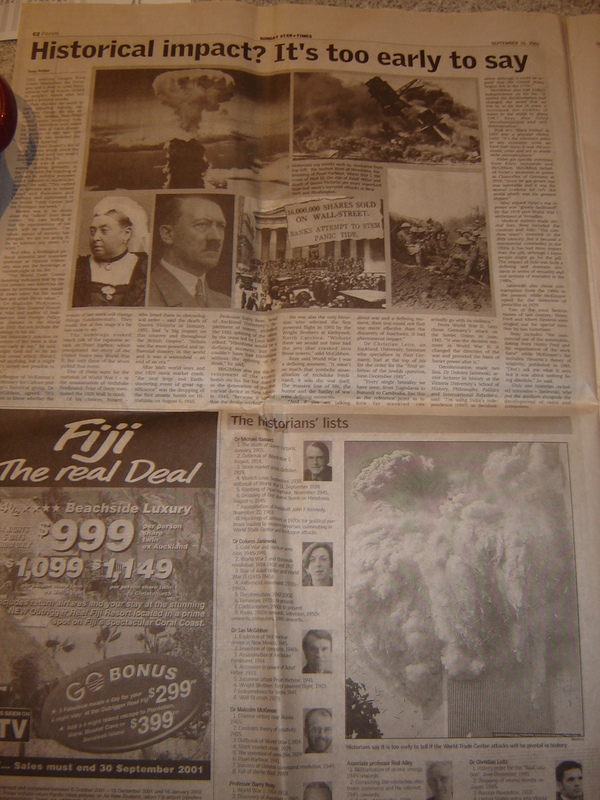 I kept newspaper clippings, or should I say entire newspapers from September. 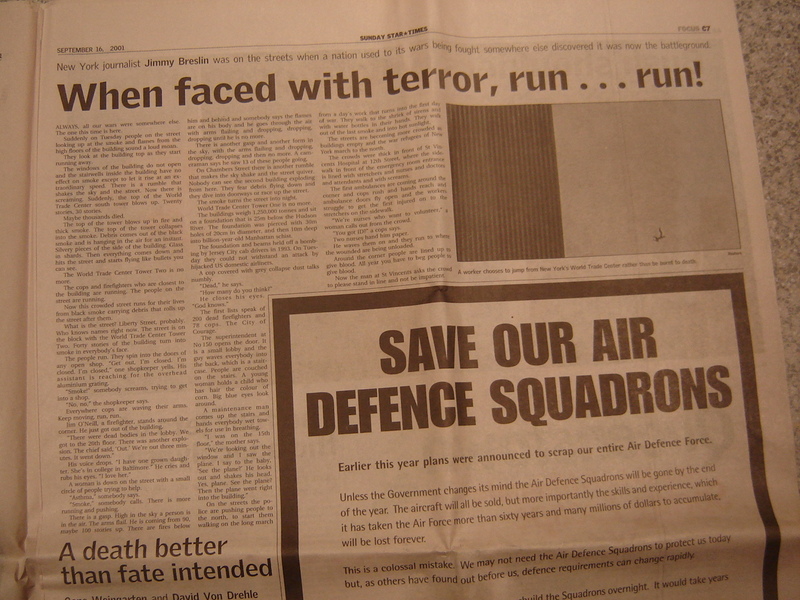 Papers like The Sunday Star Times did a special section dedicated to the attacks – the time lines, the aftermath, pictures. So many pictures. You could say that it was the first significant event of the digital age that was broadcast around the world in seconds. That is just one reason why the world changed. 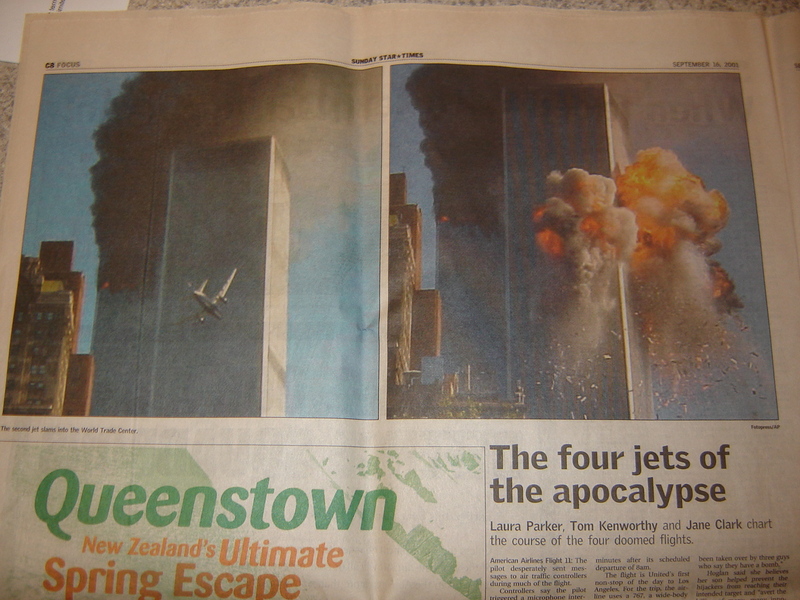 Even though I didn’t realise until a few years later, 9/11 changed more for me that I can even contemplate. The world shrank. I was more aware of what was going on in other countries and just in general. 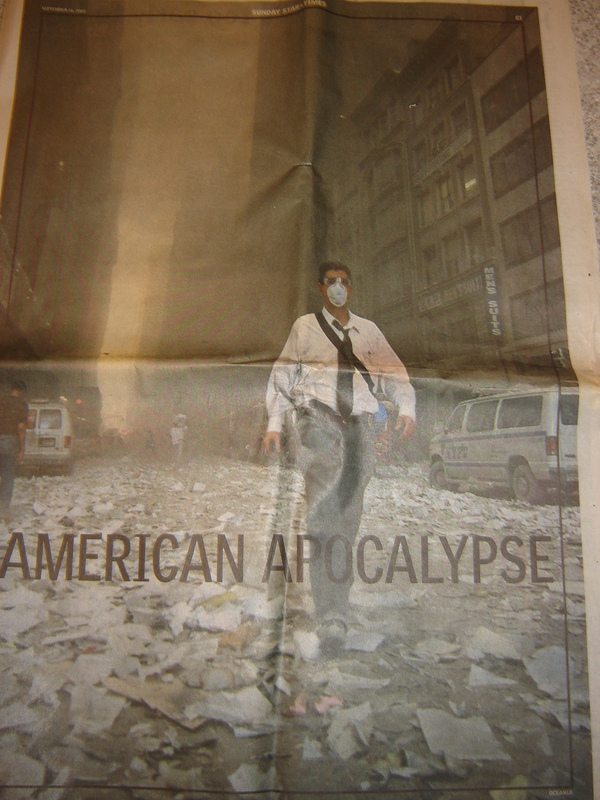 I began actively watching the news and reading the paper. 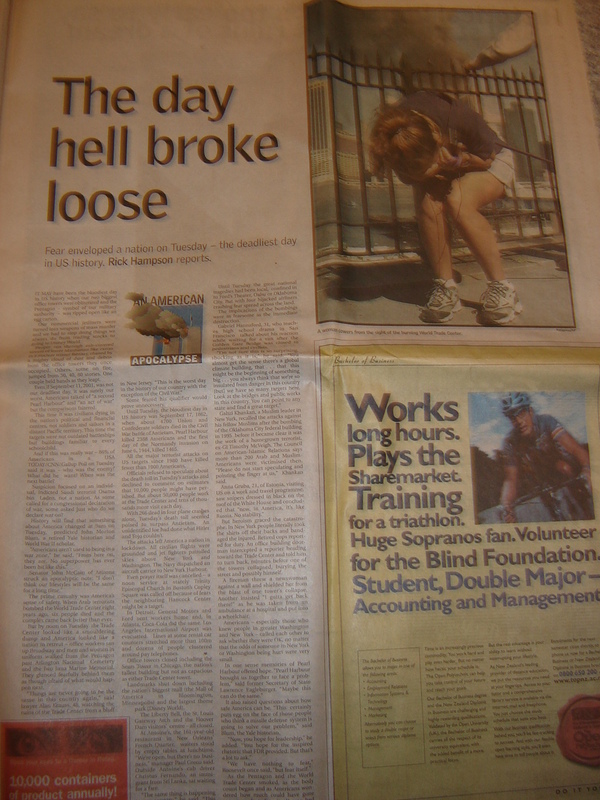 For me 9/11 played a part in my career path – that of becoming a journalist. Even now, looking at these, the photos, I just can’t fathom it. I don’t like saying RIP about people who have died, I don’t know why, so I don’t really know what to say here. But I hope those that died and their loved ones who lost them are doing ok. It was a horrible way to die. I mentioned earlier that my Dad has only ever come in to my room three times to wake me without knocking. The first was 9/11. The second, the day my Nana died – April 20, 2003. 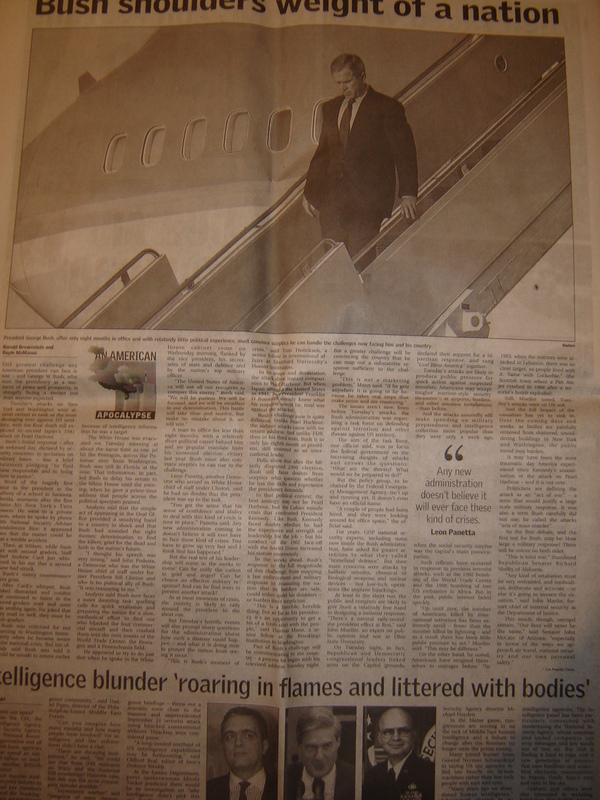 Third – September 4, 2010. Each of them just as life changing as the next. My keyboard will be pried from my cold dead hands. I woke up ridiculously early this morning. And by ridiculously early, I mean 8.30. Now, to you this may not seem that early, in fact it’s down right reasonable, but for me, it means that I’ve only had about five hours sleep. Can I get an IV of Red Bull? Thanks. What finally got me out of bed was a phone call. I am now *drum roll* a contributor to Oh, The Scandal! I start Monday. Now, it is an unpaid writing gig, but I’m seeing it as an opportunity to be writing every day, building up my portfolio and having something else that I can add to my CV. This is me keeping the momentum going. If you remember, I blogged last week how I felt I was losing the momentum I had gained while working in community papers. And I had. But hopefully, now that I have this, it will keep me going till I find that job. I will most likely try and juggle both, when that day comes. So after that excitement, I had a fairly lazy day. Just ended up watching day-time TEEVEE with Mother. MAN PIECE IS ARRIVING BACK IN THE COUNTRY AS I TYPE THIS. I started another new blog. I’m starting to become one of those out-of-control-bloggers. Anyway, it is about politics. I will basically be following the New Zealand general election and writing my thoughts on the events of each day or week and maybe even doing a few specialty pieces about the state of things in New Zealand. Or the controversial issues that will be at the forefront of this election year. I may even do “A day in parliament” posts, as I will be heading to Wellington in eight days and need to find things to occupy me while Man Piece is off being a work dork. If you think I need my laptop confiscated, you will have to pry it from by cold dead hands!